Cut the potatoes in to quarter and boil until it becomes tender. Boil the chickpeas as well or canned chickpeas can also be used. 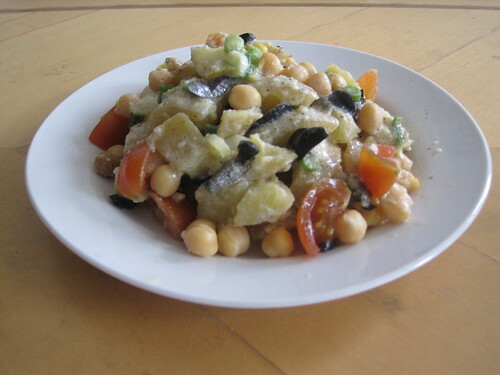 Chop salad onion,Olives and cherry tomatoes. Take Olive oil in a bowl and add lemon zest and juice and mix well. Add dijon mustard and yogurt and whisk well with salt and pepper. Now our dressing is ready to go with potatoes. pour half of the dressing over the warm potatoes and let it cool. 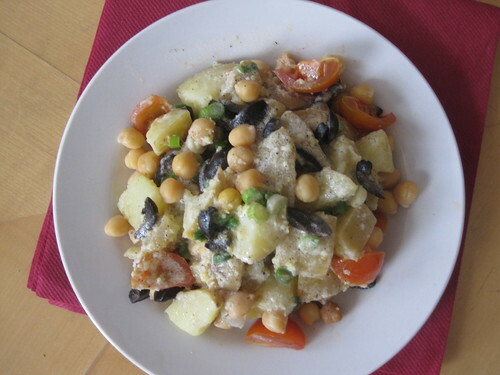 Then add salad onion, cherry tomatoes and Olives to the dressed potatoes. Toss well and add remaining dressing to salad and serve at room temperature. This Greek Potato Salad can be served with breakfast. Enjoy and have fun. Check out my fellow bloggers in marathon originated by Srivalli. That's a good one Ila - We make a version of this at home which event the kids enjoy! Healthy n yumm looking..dressing is awesome combinations. very healthy and colourful salad. Salad looks fabulous,yummy and delicious..
Yummy and flavorful greek potato salad. Looks so yummy, lovely dressing. Your salad looks lovely and flavorful! With some soup or juice on the side this would make a hearty meal. Healthy and nutritious salad..luks so fresh. A filling one for sure. Looks Yummy ila!!! thanks for healthy n delicious salad ideas. Have Bookmarked them!!! !